Francesco Anile: the extraordinary story of a tenor who took on La Scala. From the Clarinet (where he graduated as an "outsider" of the conservatory – through private instruction) vocal performance is a very short step for him. Francesco Anile begins to study and graduates as a baritone at 29 years of age. Yet everything still has to happen. He decides to be heard by Aldo Protti, in Cremona. (In those years, Francis taught Music Education in Elementary School. There was little time. He would leave from Calabria Sunday evening, by train. After a long journey, he would arrive in Cremona around 1:00pm on Monday and would leave again immediately after his voice lesson). The great Maestro welcomed him with open arms. He feels that something is wrong: the center of gravity of his voice is not the vocal cord of the baritone. He meets a young singer, who is to become his life companion, Caterina Francese. "Listening to her I realized that I did not know how to sing, even though I had already graduated. Her talent won me over. I finally decided to get serious". Francesco was thirty years of age. With the belief of not knowing if he was making the right choice, he decides to study as a Tenor and goes to Florence – relying on Ottavio Taddei. The change of his vocal register represents a turning point in his artistic career. We define him gradually as a grand vocal stature of a lirico-spinto tenor. Francesco Anile’s career was not an easy start. "I was 35, I was doing auditions, competitions (many of which I awarded). All they asked me was why had I had not sung before. My age had created many difficulties for me." He did not give up. With passion and determination, typical of the land where he comes from, he goes on, he continues to study, and he believes. The facts speak for themselves. He begins to appear on the international circuit - the one that counts. From then on it is a continuous progression: Tokyo, Seoul, Zagabria, Malta, and Cairo. Then La Fenice, St. Charles, Il Giglio, Caracalla... Cremona, Palermo. In 2011, at age 49, is the consecration at La Scala. Maestro, how did you feel when you sang in the temple of Italian opera? It was great emotion. La Scala is unquestionably the highest point of arrival for a singer - not only if he/she is Italian. Everything is special in this theater: the stage, the audience, the atmosphere ... I'll have that moment with me for a long time. The intense emotion is poured completely in the interpretation - the audience understands. Direct, passionate, enthusiastic, even in speaking of himself and singing Francesco Anile is generous, helpful, and is always accompanied by an authentic and disarming modesty. "This year I had the good fortune to teach at the Conservatory and I found myself facing a bleak reality: the students looked at me as if I was a Martian. Nowadays those who choose to teach must give up his/her artistic career - meaning that a singer who has a career cannot conciliate the two professions. And so, inevitably, singers do not teach and teachers do not sing. This makes a lot of difference. Singing only in the theater one has the real perception of what is a full sound - the one that runs "bypassing" even the orchestra. This is the fundamental difference between all the other instruments and singing. If you have not seen yourself “on the field" and you do not have in your mind this practical dimension, how can you teach it? Singing is a craft, not a profession - you have to do it in order to teach it. And it is for the same reason that today teaching tends more often to the transmission of "information" and not the practical solution of the problem. If, for example, a student makes a sound that is not correct, "while suffering," besides "informing" him/her of this technicality which is not correct and identifying the cause of the difficulties, one must be able to provide both an explanation and, most of all, a concrete indication to overcome it." As you have seen www.cantarelopera.com is a site geared primarily to the formation of the singer. Therefore, I think that the path that led you here to become a “real” and complete singer is of great interest for all those studying or are moving towards their first steps in the theater - exactly because on this particular pathway one finds common elements that relate to many life stories: misclassification of the voice, the difficulty of finding the right path, and above all, being able to start such an important career after the age of thirty five. Therefore, let us speak of vocal change. There many tenors who have started as baritones. In fact, it happens much more frequently than you think: it is primarily the responsibility of the teacher. And more common, obviously, it happens with voices that are "big" and prone to being dramatic. Often, in order to avoid problems, the teachers leave the students in the lowest register in order "not to hurt" the students - so they are not likely to be at risk. However, in reality, the student suffers and loses time. When one has these doubts, what can one do to drive them away? What did you do? Many dissuaded me to take this step – actually everyone. My wife’s teacher told me that it would not be easy and that I would have risked of no longer being a baritone without even becoming a tenor. However, I was convinced. I had people who did not know me listen to me. I also went to a speech pathologist to have the "anatomical" confirmation. In fact, when Maestro Taddei of Florence listened to me, he told me: "Well, if you're not a tenor…!" Within 4-5 months I was able to sing in my new vocal register. And then, finally, how did your career start? I studied up until the age of thirty three. Then, in 1994/1995 I was in the choir at the Teatro Regio of Torino. In July 1995 I left the choir and started singing as a soloist. Again, even this is an extraordinary fact. In those years, the age limit to participate in competitions of certain importance was around 30 and 32 years of age. Even today it works more or less like this. Even in Theatres (and agents) prefer young singers. How did you manage to make yourself known? Having a lot of patience and keeping the belief in myself alive. Of course, even I understood that at a "certain age" one could not have the illusion of making it into a big career. I was also lucky. One of my precious friends in Rome, Stefano Anselmi, believed so much in me that he encouraged me and helped me by giving me some opportunities to sing. As a result, on the field I could demonstrate and take away the doubts that arose mainly from my age. So we can launch this message of hope: those who have the vocal means and study seriously can succeed, even if they are no longer young? Of course! If one believes that he/she has what it takes - one must to try to pursue a career. One must believe it. However, not through self-belief - one has to be heard as much as possible, and listen carefully to the comments of others. Qualities, if any, will be recognized. In order to sing in a theater it is essential not only to have the voice but to be able to sing. It is not a question of age. And your story proves it. As we have said many young people go through "bumpy" roads before becoming accomplished vocally. In fact, it is not rare, especially in Italy, to lose many years precisely due to being misguided. I receive many letters from singers who are studying at the Conservatory, then change teachers, follow expensive master classes and vocal specialization courses, but do not get to be heard in the theater. At thirty years of age (and more) they do not feel ready yet. We can say, except rare lucky cases, a singer in Italy today is left to fend for himself/herself? Totally agree. Let's go back to what happens in the Conservatory. There are many teachers who have almost never set foot on stage. It is a flaw of the Italian academic system. This system cannot produce voices ready to debut, or at least already formed. Yet, how many classes for vocal performance are there in Italy? Many. How many graduates later are working singers? Very few. Do you agree that having the opportunity to take lessons from singers in full career could establish an exceptionally constitutive opportunity? Yes. For this reason, last year when I was at La Scala, I gladly accepted the nomination at the Conservatory, even if I had to go up and down from Milan to Cosenza. Let us talk about the choice of repertoire. Many singers are tempted by a repertoire that is not of their own vocal style. Within the tenor repertoire, there are blatant examples of singers who have not understood their vocal changes and have had problems in the theater. What do you think? I think we have to respect our own voice – the exact "size." It is useless to try to wear clothes three or four sizes too big. The results can only be negative. The voice is at its best when it moves at ease. Sure, who would not like to sing "Otello"...? Unfortunately, this error has also been committed by singers who are already well-known and with results that are known to all. Respecting one’s own voice also means singing for a long time and keeping a healthy voice. In addition to the power of sound, always perfectly in focus, it is quite striking to notice the softness of your face, and the nobility of your posture. In addition, the fluidity of your pronunciation...it seems that you do not fatigue at all…how does one obtain this result? It is the mastery of technique which then allows you to be expressive. All the work is internal, both the opening of the throat and the respiration do not depend from the face – which remains soft and natural. Most of all, the face is where the emotions of the character are drawn. Therefore, it is essential that the technique must be secure in order to tackle the interpretation. I want to take this opportunity to ask you some questions about technique. It is breathing and the diaphragmatic support (appoggio). Everything in singing depends on this. The function of all the muscles are involved in the process breathing: the lower abdominals, the inner costal muscles and, of course, the diaphragm. The proper use of this support (appoggio) and its ability to sustain is also responsible for the softness and projection of the sound. When the respiratory cycle is not correct, the neck stiffens resulting in a negative impact on the sound. Let's get a little more into this topic. The confusion on respiration is still quite widespread, despite recent scientific studies on the subject that have helped to define its basic concepts. Even today there are several schools of thought - inviting one to either hold or push the diaphragm down. What do you think? It is true - confusion reigns. I have tried to simplify the explanation of breathing. I say to my students "look at a crying baby: it has an open throat and a powerful sound." Or try to move the flame of a candle without extinguishing it and you'll understand which muscles are activated. It is a matter of balance between the different muscle chains. The diaphragm alone cannot do anything- it is a pump driven by other muscles. Once the diaphragm is lowered because we took in air, it relentlessly rises and is helped in its movement. This rising can be obstructed to get a more powerful sound- but only when needed. It depends on the sound one wants to achieve. Furthermore, it should be said that we should not worry about taking in a lot of air. Instead, what is more important is to get the air out and put it to the best use. I have seen many people breathe in an exaggerated way: it is not needed. It does not work for the voice. Taking in too much air also means creating a very high internal pressure that rather than bringing out the voice – it blocks it. It is easy to become "engulfed" vocally. Today, thanks to the progress of scientific inquiries, when one wants to explain a vocal mechanism, one tends to express himself/herself with technical terms, borrowed from physiology and anatomy. This we owe also to renowned doctors who talk about singing. What do you think of this intrusion of science in singing? I think it is helpful to have knowledge of science as an element of enrichment, but it has nothing to do with the voice. Singing is an artistic fact that involves the whole person. It should be perceived as a whole – giving the essential attention to breathing and the projection sound. Rather, I think it is very important that those who study voice, learn to listen to themselves in order hear the difference between a right and a wrong sound –associating the correct sound to the corresponding physical sensation. The slightest movement can cause very large changes in the sound. Often those who study do not realize it. It is the role of the teacher to enhance the sound emitted in the right way – giving precise indications. In this sense, recording oneself and listening to oneself is very useful. Among the male voices, the tenor, in the great tradition of Italian opera, is the one who plays the "stronger" characters - both emotionally and psychologically: for the fragility, for the courage or for the adverse fate. For this reason I always thought that being a tenor is not only being an opera singer, but obeying an artistic and musical "necessity”-that is, dressing up in a second identity which overlaps one’s own from time to time, and completely becoming -the character. I always thought that this "transformation" could follow the tenor even off the stage. When one plays a character, one already dresses into another identity – surrendering oneself to Canio, to Turiddu ...but when one leaves the stage, one goes back to being oneself again. Even now, when I'm out of the scene, I am called "Maestro": I laugh and say "thank, you can call me Francesco". In life I am just only and simply Francesco. At this time my repertoire is the ‘verismo’ style. I love Puccini and Mascagni. I sang Verdi's Aida and Othello. I always try not to deviate into repertoire where I cannot give my best. I feel that I have a talent for strong and heroic roles, not for sentimental ones. And often the vocal style also reflects the character of the person. Also here, it is good to work with nature. Do you agree? Do you agree with the practice of lowering the tonality of some arias? Let us use the classic example of "Pira". Let me start by saying: the range of musical instruments is higher today than at the time of Verdi. 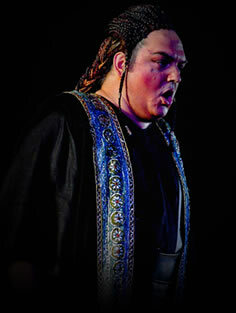 For the type of tenor starring in Il Trovatore, the ‘Do’ (C) is certainly the highest note. In this case, then, I do not find anything wrong. It would be a form of useless fundamentalism. It must be also said, especially in Italy, including some arias that you just mentioned - one waits just hear the high note. However, I repeat that this fact should be limited only to the arias of tradition with extreme upward range toward the high notes and as such must remain limited only to these situations. He is great. 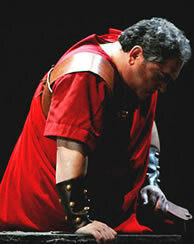 I can say that I was lucky enough to wear in Rome in Aida in 2008, a costume which was written with his name. I was almost afraid to touch it. He had an amazing, powerful, and versatile voice. His ability to go into half-voice has written the history of singing. He left memorable interpretations…a great singer but with an absolutely personal and particular technique. He was the he most important Othello in history. Although, it is right to remember him in other interpretations, such as: Manon Lescaut, of which I listened to a superb recording. The future engagements Francesco Anile. In February I will be in India, in Mumbai for "Pagliacci." In March I will be in Verona for "Iris" by Mascagni - a piece that I love very much. You live in Calabria - in Polistena. A true story, in some respects "verista,” this story of Francesco Anile. I was deeply affected by the mixture of kindness, sincerity, and passion in his way of being a man and an artist. I made him promise to hold a Master Class in Rome for Cantare l’Opera ®, when he returned from India. We will be waiting for him - impatiently.